For opening hours information, please contact Vaughan 400/7 Power Centre directly. SmartCentres Vaughan 400/7 Power Centre offer more than 8 brand name stores. 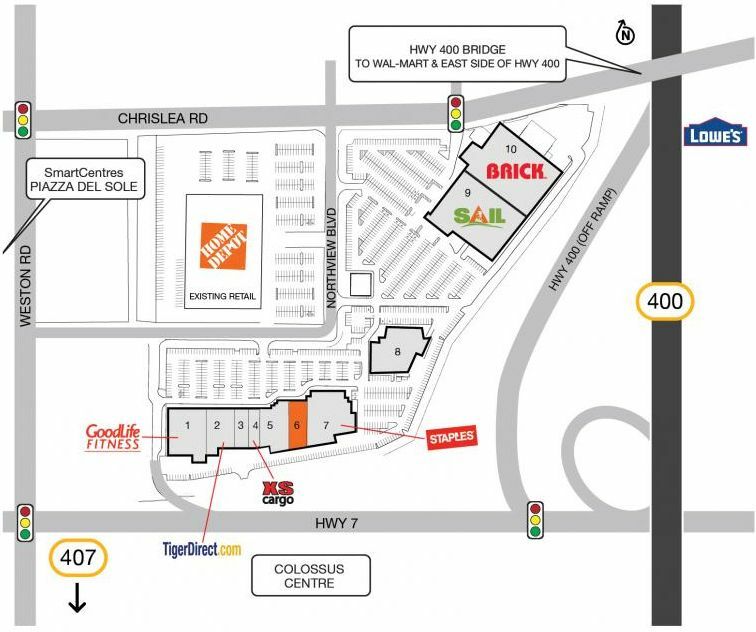 SmartCentres Vaughan 400/7 Power Centre is located in Vaughan, Ontario - 101 Northview Boulevard and 137 Chrislea Road, Vaughan, Ontario, L4L 8X9, Canada (GPS: 43.793739, -79.544529). Look at the list of stores in SmartCentres Vaughan 400/7 Power Centre, hours, location and information about mall and special events, sales, coupons. You can choose store from list below and get detail information - other stores locations for the brand, location, shopping hours, phone, map, directions contact. SmartCentres Vaughan 400/7 Power Centre is one of the best shopping place for spend your free time - mall/shopping center has all types of stores - outlets, department, fashion, traditional and more. Have you ever visited SmartCentres Vaughan 400/7 Power Centre? Do not forget to write shopping review and rate your satisfaction. Vaughan 400/7 Power Centre is 256,460 square foot shopping centre. The center is anchored by SAIL and The Brick, at a combined 126,600 square feet. Founded over 40 years ago, SAIL “the Outdoors Superstore” currently offers the largest network of outdoor, camping, hunting and fishing stores in Eastern Canada. Other major tenants include Staples, XS Cargo, Good Life Fitness, and TigerDirect.ca. Ambrosia Fine Foods opened recently, Home Depot. Vaughan 400/7 Power Centre is situated at the intersection of Highway 400 and Highway 7 in Vaughan, Ontario. Give us your experience with SmartCentres Vaughan 400/7 Power Centre by writing a short review.